If you’re convinced you’ll never be able to learn bird calls, start with the Gray Catbird. Once you’ve heard its catty mew you won’t forget it. Follow the sound into thickets and vine tangles and you’ll be rewarded by a somber gray bird with a black cap and bright rusty feathers under the tail. 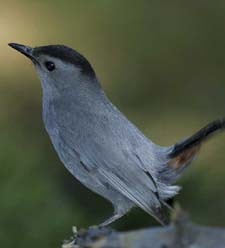 Gray Catbirds are relatives of mockingbirds and thrashers, and they share that group’s vocal abilities, copying the sounds of other species and stringing them together to make their own song.